Sally was born in Stockton, just after midnight, in a thunderstorm. She’s always loved stories, and spent her childhood trying to make real life work like it does in books. At the age of twenty-two she enrolled on an MA in Writing for Young People at the university of Bath Spa, where she wrote her first novel, Ways to Live Forever. the Costa Book of the Year and the Guardian Children’s Book Prize. Her books have been translated into over twenty languages, and Ways to Live Forever was made into a feature film. Sally lives in Oxford and spends her time writing stories, looking after he r little boy, and trying to believe her luck. 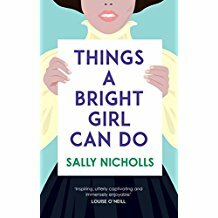 Things A Bright Girl Can Do: Through rallies and marches, in polite drawing rooms and freezing prison cells and the poverty-stricken slums of the East End, three courageous young women join the fight for the vote. Evelyn is seventeen, and though she is rich and clever, she may never be allowed to follow her older brother to university. Enraged that she is expected to marry her childhood sweetheart rather than be educated, she joins the Suffragettes, and vows to pay the ultimate price for women’s freedom. May is fifteen, and already sworn to the cause, though she and her fellow Suffragists refuse violence. When she meets Nell, a girl who’s grown up in hardship, she sees a kindred spirit. Together and in love, the two girls start to dream of a world where all kinds of women have their place. But the fight for freedom will challenge Evelyn, May and Nell more than they ever could believe. As war looms, just how much are they willing to sacrifice? Close Your Pretty Eyes: Eleven-year-old Olivia has been in care since she was five, and is just beginning her sixteenth placement. Her new home is a secluded farmhouse, centuries old, where she slowly bonds with her foster family. But the house holds dark secrets. Olivia discovers that it was once a notorious baby farm, where unwanted children were left to die. She becomes convinced that the place is haunted. She is desperate to save her new family from the ghosts. The danger is real – but does it come from the twisted mind of a very disturbed child? A powerful and thrilling story from one of today’s most exciting young writers. Ways To Live Forever: “My name is Sam. I am eleven years old. I collect stories and fantastic facts. By the time you read this, I will probably be dead.” Sam loves facts. He wants to know about UFOs and horror movies and airships and ghosts and scientists, and how it feels to kiss a girl. And because he has leukaemia he wants to know the facts about dying. Sam needs answers to the questions nobody will answer. Funny and honest, Ways To Live Forever is one of the most powerful and uplifting books you will ever read.